We have all heard sayings over the years, such as, “Early to bed and early to rise makes a man healthy, wealthy, and wise,” “By failing to prepare, you are preparing to fail,” or perhaps one of my favorites, “Honesty is the best policy.” These, and many more, are quotes from one of the men who helped turn the British colony of America into a young and vibrant country, and his name is Benjamin Franklin. 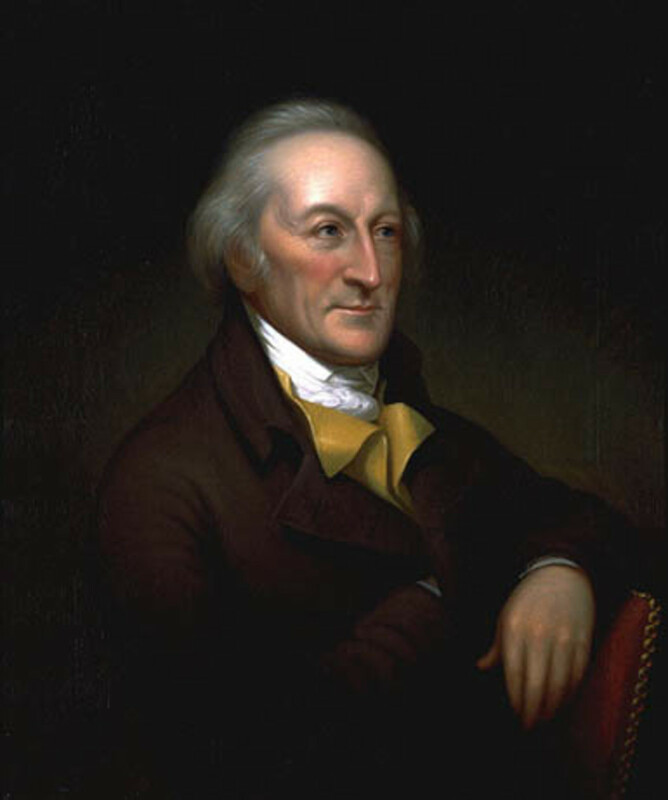 Not only was Ben good at clever sayings, he helped draft the Declaration of Independence and the Constitution of the United States, established the postal system, helped turn electricity from a parlor trick into a powerful force that would change humanity, and achieved many more notable accomplishments. Though Mr. Franklin is long gone, his legacy lives on; take a look at those hundred dollar bills in your pocket and you’ll see the man this short biography is about. Benjamin “Ben” Franklin was born in the bustling seaport city of Boston, Massachusetts, in the English colony of America on January 17, 1706, on Milk Street. Benjamin was baptized at the Old South Meeting House, which was not far from his house. He was part of a large family composed of 17 children. Ben was the tenth child and youngest son. His father, Josiah Franklin, also the youngest son, made candles and soaps. Ben’s mother was Abiah Folger, Josiah’s second wife. Ben learned to read when he was very young. After a year in grammar school, he was under the tutelage of a private teacher for another year. Josiah hoped that Ben would become a clergyman. However, after a short period of study at the Boston Latin School, he was unable to support Ben’s tuition. Apprenticeship started early for Ben Franklin. An older brother named James worked as a printer. After working with his father for a time as a candle maker, Ben started working under James at age 12, his formal education having concluded a couple of years earlier. He served as an apprentice from 1718 to 1723, which was a fortuitous time for Ben, for he developed his mastery of printing during this period under his brother’s supervision. Developing his talent for writing prose was one of Benjamin Franklin’s earlier preoccupations. His failure at writing good poetry encouraged him to focus on developing his style in writing prose instead. He used copies of the paper, The Spectator, which came out of England from 1711 to 1712, and featured the essays of Sir Richard Steele and Joseph Addison. He modeled his own writing style after theirs by memorizing and analyzing their works. Attempts to convert the essays into poetry were made, and then Ben transmuted the output back into prose. Later in life, he recognized the importance of his efforts at improving his talent for writing, and acknowledged this endowment as a principal means of his advancement in life. In 1721, when he was 15, Benjamin Franklin’s brother James founded The New-England Courant, which was published as a weekly newspaper. He was one of the readers who contributed to the publication, writing under the pseudonym “Mrs. Silence Dogood.” He assumed the identity of this widow after being denied the opportunity to write as himself because he was deemed too young. The 14 essays he produced, in which he lampooned popular topics of discussion, were universally well regarded. The essays became the talk of the town. Ben assumed the persona of a witty and ingenious middle-aged woman in these writings, and he managed to make everyone, including his older brother, believe that the writer was indeed the character personified. When James discovered that Ben penned the articles, he was quite unhappy. Nevertheless, in 1722, Benjamin was placed at the helm of the publishing firm when James was jailed for a short while after publishing unflattering material. Ben became a fugitive when he left the publishing house without permission at age 17 and found his way to Philadelphia. In Pennsylvania, Benjamin Franklin started a new life as a worker in printer shops. He was sent to London by Philadelphia Governor Sir William Keith to procure new equipment, but it turned out Keith was not serious about supporting the establishment of a newspaper at all. Franklin decided to stay abroad and work as a typesetter at a shop in London’s Smithfield area. Young Franklin found London to be a fascinating place, far more modern than Philadelphia or Boston. He returned to Pennsylvania in 1726 and worked as an employee under Thomas Denham, a merchant. Although he stopped going to school at the age of 10, Benjamin Franklin continued to educate himself by reading extensively. He also taught himself to write. When he was 20 years old, Ben Franklin sought to actively improve his character by developing 13 virtues. He listed these virtues in the autobiography he wrote later in life. The 13 precepts were composed of temperance, silence, order, resolution, frugality, industry, sincerity, justice, moderation, cleanliness, tranquility, chastity, and humility. These virtues became some of the guiding principles of his long life. Benjamin Franklin proposed marriage to Deborah Read in 1723 before he left for London at the behest of Governor Keith. In his absence, Deborah was married to another man with the blessing of her parents, who opposed the engagement with Franklin. The man she married soon escaped his debts with Deborah’s dowry, leaving her for good. Franklin and Deborah finally married on September 1, 1730, when she was freed by law to remarry. They started a new life as a couple and took in William, Ben’s illegitimate son, who was born out of wedlock. William’s mother remained unknown, and Benjamin Franklin acknowledged him formally in 1730. Together, the couple had two children of their own, Francis and Sarah (Sally). Francis Franklin was born in 1732 and died four years later due to smallpox. Sally Franklin was born in 1743 and grew up to marry Richard Bache and have children of her own. She was the one who took care of Benjamin Franklin later in life when he was an old man. William Franklin went to London himself to study Law. He passed the bar exam, and with his father’s help, William was appointed as the last Royal Governor of New Jersey in 1763. Later on, father and son were estranged due to differences with regard to the American Revolutionary War. When war broke out between America and Britain, the elder Franklin choose to remain loyal to the colonies while his son would remain loyal to the English Crown. The broken relationship with his son was one of the great tragedies of his life. Deborah Franklin died of a stroke in 1774 while her husband was abroad in England. They hadn’t seen each other for ten years due to his work for the colonies in England. Ben Franklin never remarried after the death of his wife. Benjamin Franklin was very curious about the world around him and began investigations on the phenomenon known at that time as “electrical fluid.” His work resulted in many important findings that were useful to scientists who came after him. He was the first to establish that “resinous” electricity and “vitreous” electricity were the same entity, but were in their respective states due to pressure differences. Franklin labeled them “positive” and “negative.” Franklin also pioneered studies on conservation of charge. There are marked differences in accounts describing Benjamin Franklin’s attempt to prove that lighting is a form of electricity by flying a kite into a lightning storm. Some historians believe that contrary to the more daring version wherein Ben Franklin presented himself to be struck by lightning, he was insulated and employed safety precautions. It was known that Franklin also promoted the principle of “electrical ground.” Some experiments that were conducted later that mimicked Franklin’s original design were successful at obtaining an electrical charge from a storm cloud, as Franklin originally intended. Franklin’s kite experiment brought him fame all over the world as a scientist. His work on electricity was recognized in 1753 when the Royal Society awarded him the Copley Medal, the eighteenth century equivalent of today’s Nobel Prize. Three years later, he was elected Fellow into the prestigious Royal Society—one of the few Americans given the honor. Moreover, the cgs unit of electrical charge that is equal to one statcoulomb was named after him (one franklin or Fr). Franklin made a significant discovery about the growth of the population of America after studying the notes he made during the 1730s to the 1740s. Aside from determining that the growth of the population in America was the fastest at that time, he associated the phenomenon with the abundance of food supplies, specifically the vast area of farmlands in the New World. Franklin published “Observations concerning the Increase of Mankind, Peopling of Countries, &c.” in 1755. It was originally drafted in 1751, and reprints in Britain reached many intellectuals. In fact, Franklin was credited to be an important influence in the theories later developed by Adam Smith on economics and Thomas Malthus on population growth. 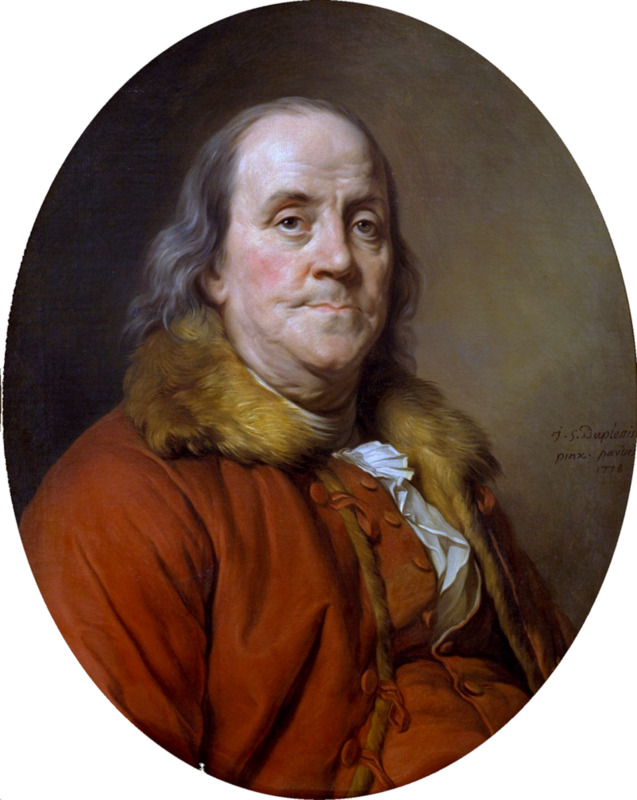 Benjamin Franklin engaged himself in many other topics of study, including the behaviors of Atlantic Ocean currents, the wave theory of light (in support of Christiaan Huygens), and meteorology (storms, and the long-term effect of an Icelandic volcanic eruption on the winter of 1784). He also conducted experiments on refrigeration and electrical conductivity. Franklin invented new devices that made life simpler and more convenient for the residents of the colonies. 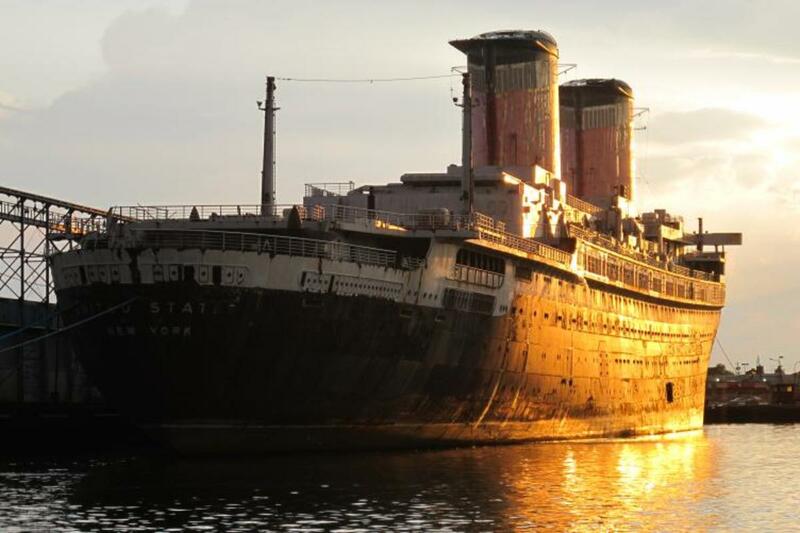 One of his inventions, which he didn’t bother to patent, was the lightning rod. A lightning rod was a simple metal device placed at the high point of a building, and from it a metal wire ran to the ground. If the building was struck by lightning, the lightning rod would conduct the lightning to the earth, thus sparing the house from destruction by a direct hit from lightning. This method of protecting buildings from lightning is still in use today all over the world. Another of his more notable inventions was bifocal glasses, and he made significant improvements to the wood-burning stove. Other inventions included a musical instrument called a glass harmonica and an odometer (an instrument that measures the distance traveled by a motor vehicle). Franklin also pioneered the concept of Daylight Saving Time. 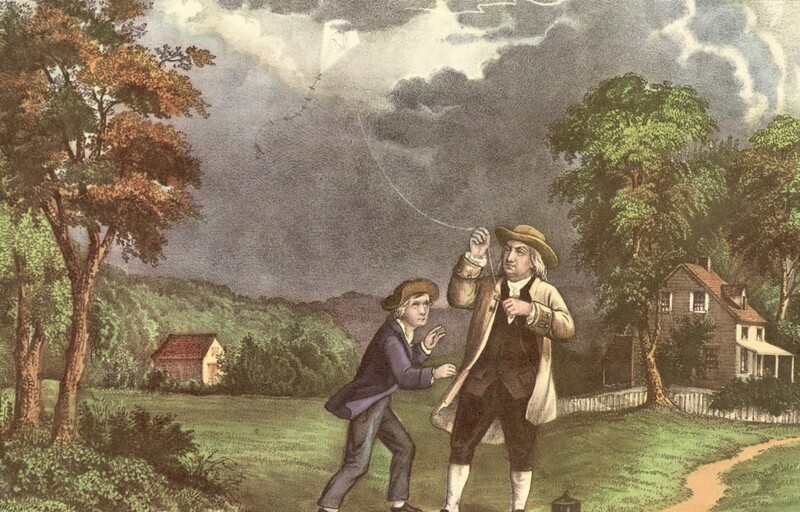 Benjamin Franklin and his kite experiment with electricity. 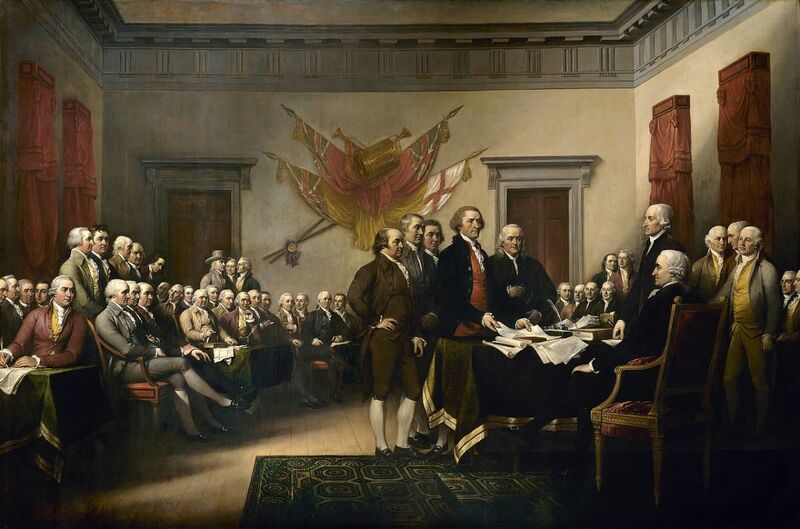 As the colony of America grew it became more independent from the mother country of England, and by 1776 America had declared its intention to become a sovereign nation. Soon after the start of the American Revolution between England and America, Benjamin Franklin was elected by the Pennsylvania Assembly as a member of the Committee of Five—a group responsible for drafting the Declaration of Independence of the United States of America. Franklin’s gout prevented him from attending many gatherings of the Committee. However, he was still able to make important contributions to the text. Thomas Jefferson sent him the draft, and he made changes that were included in the final document. During the American Revolutionary War, Franklin served an important and critical post as a diplomatic representative to France. After over a year of negotiations with King Louis XVI and the French government, Franklin managed to secure a treaty of Friendship and Commerce between the two countries. This was very beneficial to the young United States as France was one of the leading powers in the world at that time. The treaty with France was more importantly a military treaty between America and France. France entered into the Revolutionary War on the side of the Americans and declared war on Great Britain. The alliance with France would be key to the colonies winning their freedom from Britain. While in France, Franklin became a celebrity and was invited to many important social affairs and consorted with the elite of France. As the Revolutionary War drew to a close, Franklin served as a member of the negotiating body that drew up terms to end the war with Great Britain and recognize the 13 colonies as the constituents of a sovereign nation. After the Treaty of Paris was signed in 1783, Franklin remained in France as America’s ambassador. In 1785, Congress agreed to replace Franklin with Thomas Jefferson as ambassador to France, which allowed Franklin to return home to Philadelphia. Totaling the years Franklin spent in England and France, he had spent much of his adult life away from America, which led him to fear he would be “a stranger in my own country.” Though his reception upon returning to America was met with little fanfare, the young nation wasted no time putting him to work as he was elected president of the Executive Council of Pennsylvania, a position which was much like a governor. He held this position for the next three years. Now that America was a sovereign nation, it lacked a sufficient government structure and a set of laws to operate efficiently. As an elder statesman, Franklin was chosen to be a delegate for Pennsylvania to the Constitutional Convention of 1787 when he was 81 years old. Franklin used his influence to urge the other delegates to support the document, which later became the United States Constitution. The document was ratified in June 1787, and the following year, George Washington took the oath as the first President of the United States of America. Benjamin Franklin succumbed to respiratory illness on April 17, 1790, at 84 years of age. He was surrounded by his family when he took his last breath and was buried next to his wife. His funeral was attended by 20,000 mourners at Philadelphia's Christ Church Burial Ground. 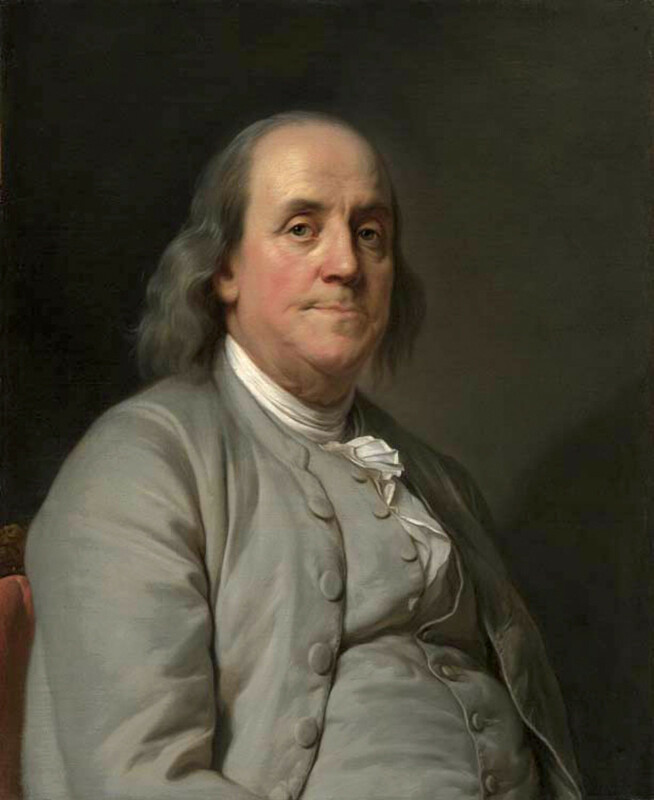 In his will, Benjamin left money to Philadelphia and Boston, which was to be used for funding various community projects. To his loyal daughter Sally and her husband, Richard, he left most of his property on the condition that Richard free his slave named Bob. Richard complied with the request and set Bob free. Freedom didn’t work out well for Bob and he turned to drinking and asked Richard to take him back in as a slave. Richard refused to take Bob back as a slave; however, he did let Bob live with them for the rest of his life. 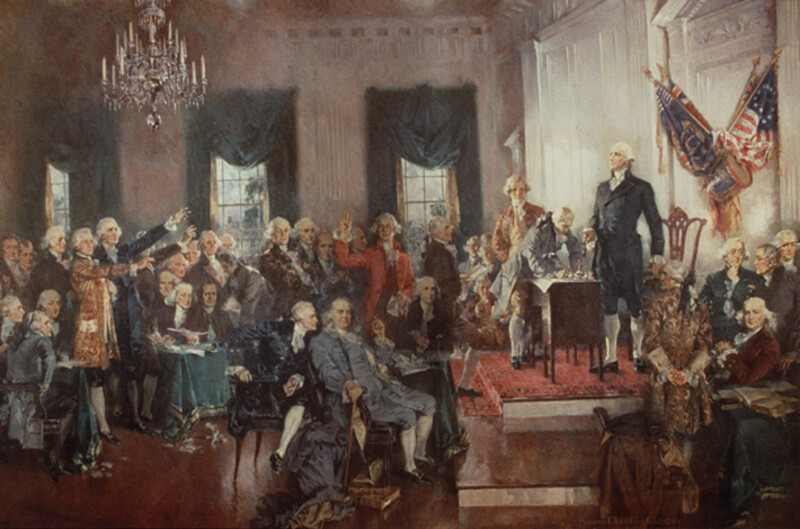 Constitutional Convention including George Washington, James Madison, Benjamin Franklin, and Alexander Hamilton. Benjamin Franklin is known to American schoolchildren as one of the key figures in the drafting of the Declaration of Independence of the United States of America. Perhaps some students remember him more vividly for his experiments on electricity. 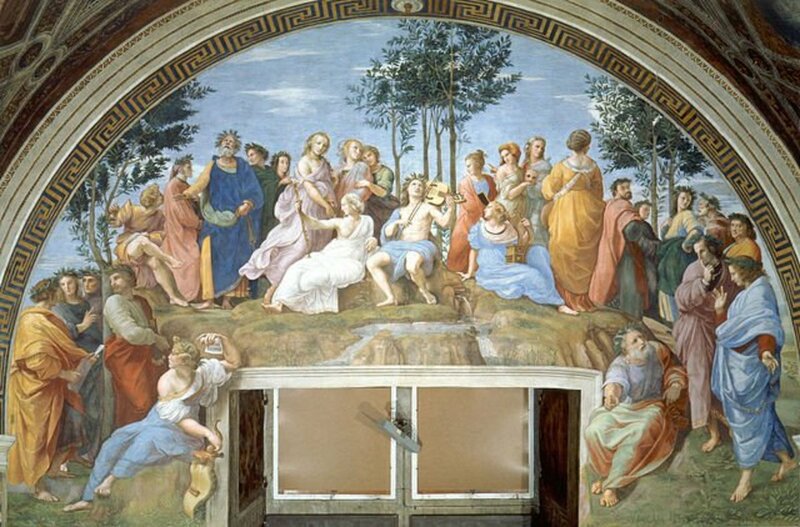 Older students might have a closer understanding of his capacious intellect and wit upon reading some of his most famous writings. Benjamin Franklin’s Poor Richard’s Almanack became the source of popular maxims that people quote to this day. Still, many criticized him and associated his rise to wealth with the “Protestant ethic” and the moneymaking business values of the American middle class. This image of Franklin emerged in the nineteenth century. In the eighteenth century, he was celebrated as a scientist, inventor, and innovator who somehow emerged from the obscurity of his modest birth to prominence, which he achieved despite a lack of formal education. He was a simple American, but his discoveries on electricity surpassed the achievements of the most accomplished European scientists of his time. In Franklin’s own view, public service came before science, and so his contribution to the formation of the United States of America was to him the pinnacle of his achievements. He pioneered ideas that helped develop American civic society, establishing public service institutions, including a hospital, an academy, a fire company, and an insurance company. 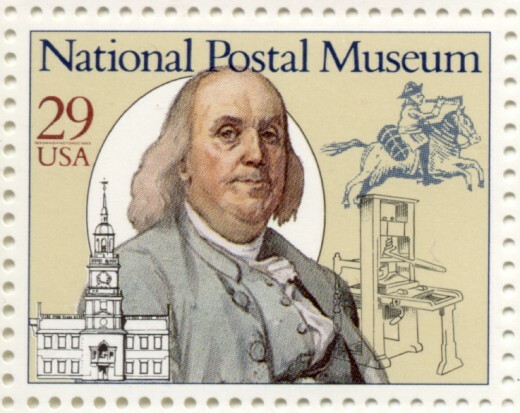 Benjamin Franklin, who served as the first Postmaster General of the United States, is the second most featured historical figure in American postage stamps after George Washington. In recognition of his contributions to the United States, Congress dedicated an 18 foot tall marble statue of his likeness as Benjamin Franklin National Memorial during the 1976 Bicentennial. 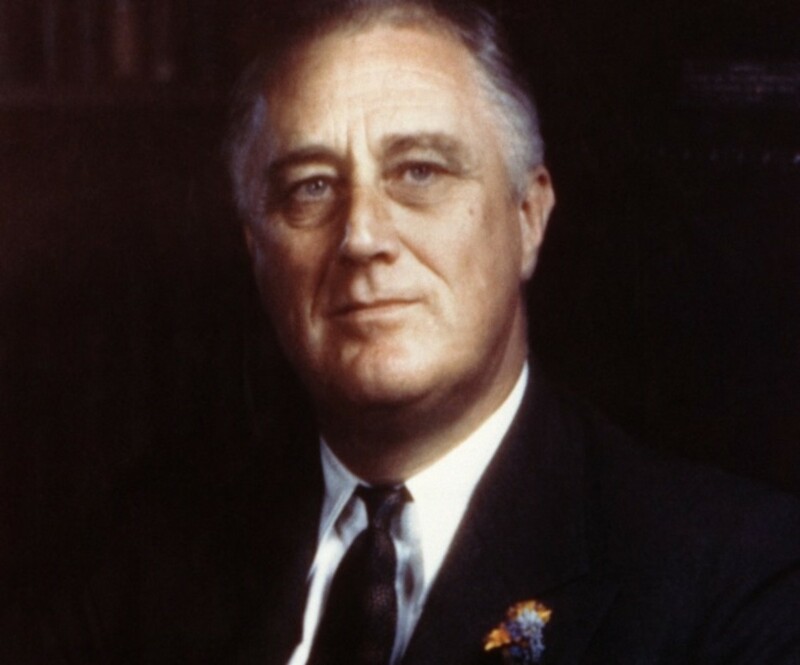 Often cited as “the only President of the United States who was never President of the United States,” his familiar visage has adorned the hundred dollar bill, known in popular parlance as “Benjamins,” since 1928. Undoubtedly, Benjamin Franklin was one of the most important Americans in the eighteenth century. Today, in Western civilization, he is considered one of the most famous figures who ever lived. West, Doug. 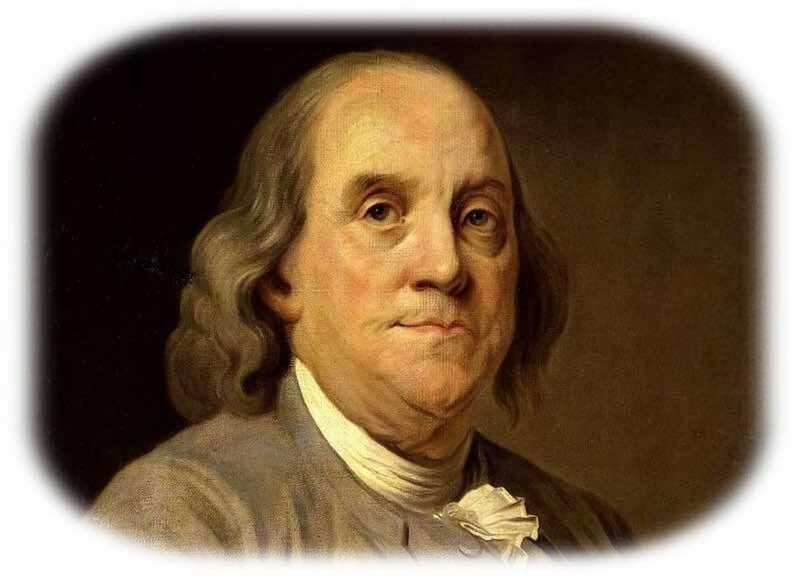 Benjamin Franklin – A Short Biography. C&D Publications. 2015. Franklin, Benjamin. The Autobiography of Benjamin Franklin. Washington Square Press, Inc. 1965. Isaacson, Walter. Benjamin Franklin: An American Life. Simon & Schuster Paperbacks. 2003. That is a very interesting article, Doug. Ben Franklin is one of those people that has always fascinated me. He was pretty much self educated, he had so many accomplishments in his life and was a father of American history. He is one of those people that if I had a time machine, I would love to go back and talk with him. Good article on a fascinating man. I read "Benjamin Franklin: An American Life." I recommend it. Enjoyed reading this article.